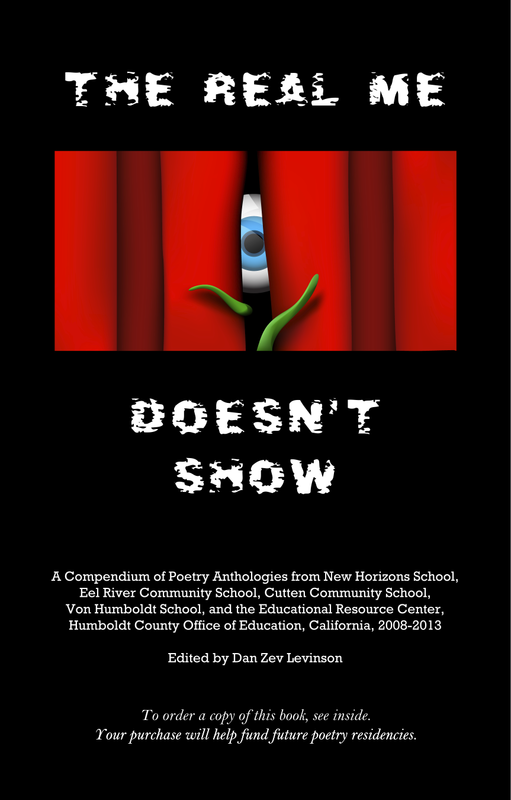 The book of students’ poetry, The Real Me Doesn’t Show, from the Humboldt County Office of Education (HCOE), is available, edited by Dan Zev Levinson: a collection of four anthologies made from 2008 to 2013. More money will be generated for teaching if you order at www.createspace.com, instead of amazon.com, where it’s also available. The version with a black & white interior costs less than the full-color version; the front and back covers will be in full-color either way. Go to www.createspace.com/4162210 (or www.createspace.com/4189985 for full color), or just search for the title at these sites. This poetry was written in what is known as alternative education, often taught in continuation schools. Dan returns again and again to sites where his presence has made poetry a normal component, allowing students to express themselves in ways that no other outlet has accommodated for them; often their expression is brutally and beautifully honest and compelling. Jen Fairbanks, principal of the HCOE Court and Community Schools, has Dan working at specific sites, each year's work culminating in an anthology which all students receive copies of. Dan compiled the first four anthologies into The Real Me Doesn’t Show. Included in these sites is Von Humboldt Court School in juvenile hall, and New Horizons School where the students are also locked inside the facility. The students have come to personally trust Dan, which he finds makes a world of difference in this situation.